Two members of the class of ’14 contacted me privately to ask about hiking in winter temperatures and conditions. One recommend that I publish what I’d shared with him. Needless to say, I was reluctant. The information is generally well known, and is readily available elsewhere. I thought about it during the last leg of my hike and eventually, decided to share it for what it may be worth to others. When I was in the Army, I taught winter operations and survival for a time. Since this knowledge has paid dividends on my hike thus far, I thought there might be a benefit to sharing it. Obviously, my musings are not comprehensive. Others may feel free to add their two cents as appropriate. If you do, please keep it civil. Dear trolls out there, neither you nor I are idiots. The good news is that winters tend to be mild in the southern Appalachians with notable exceptions. Even when the weather turns bad, it doesn’t often last long. That said, the recent five-day nor’ easter in early December brought a load of moisture to the mountains. Fortunately only the last day of the storm was cold. Otherwise, we might have experienced several feet of snow, so it pays to be prepared. Where to start? In my view, the most important winter concepts are layering and moisture management. The key to staying comfortable when it’ cold is layers and staying as dry as possible. Modern poly prop and other wicking fibers are game changers in helping your skin stay dry. Note I said comfortable, not necessarily toasty warm – a relative concept that changes with each individual’s tolerance. You absolutely don’t want to be hot and sweaty all the time. If you are, not only is dehydration likely, you’ll rapidly chill when you stop moving. Moreover, all the wet stuff will eventually need drying. On top I’m using a Columbia Onmi Heat base layer (it’s got Mylar dots that reflect heat back — and it works) with three additional light layers that can be added or subtracted accordingly. For the outer layer I have a light weight nylon wind jacket backed up by my rain parka which has pit zips, a wind collar and hood. Most times I don’t need more than one or maybe two light layers so long as I’m moving. My rule of thumb is that less clothing is more so long as it helps keep your core at the right temperature and your skin as dry as possible. In my experience, most people put on way more clothing than they need. Once I stop, I usually don’t have to take off the base layer. It is normally only wet in the back and seems to dry quickly on its own under the other loose layers I put on when I stop. There have been exceptions to this practice, of course. When the day is over, I change into a large fleece shirt, a loose fitting hiking shirt, plus one or both of my down puffy parkas, down pants and the fleece cap in which I sleep. On the bottom I hike in bike shorts and compression running tights alone or under a water repellant pair of Columbia camping pants. My rain pants go over this or substitute for the camping pants as needed. That’s potentially three layers – more than enough to take you well below zero in a stiff wind in my experience. Head, hands and feet are the key to real comfort and mental comportment. For my head, I carry a fleece ear band which keeps my ears warm while allowing the heat to vent from exertion without wet hair. I also have a polly prop knit hat I used for cross country skiing. It can go on over the ear band or replace it. Since I wear glasses, I have a Gore Tex bill cap to keep the rain/snow off the lenses. I clomp around in Salomon Gore Tex boots with medium weight smart wool socks (I carry three pairs) with sock liners. I start each day with a dry pair of socks. I also take off my damp socks and put on dry ones as soon as I stop for the evening to help keep my feet warm. The damp socks and liners go in between my sleeping bag and air mattress at night. They’ve always been dry in the morning. For my hands, I carry two pair of light polly prop glove liners so that one pair is always dry. I also have a pair of polar tec gloves and a pair of heavy mittens with a waterproof Gore Tex shell. I didn’t have the mittens in the Smokies when the ambient air temp hit zero F and paid a price for their absence. Mittens are absolutely the key to warmer hands. I’ve added chemical hand warmers and used them once. They work well enough. At night I almost always sleep in a tent (Big Agnes Fly Creek UL2) unless I think it’s going to storm. The tent blocks the wind and is about 10 degrees warmer than an open shelter. My bag is a woman’s Sierra Designs Dry Down rated to 25 degrees F. My guess is that a male would be comfortable about five degrees cooler. As I wrote in my previous blog, I’m exchanging the sleeping bag for my 1970’s Holubar zero degree model in which I have more confidence at lower temperatures. At night any wet clothing – usually socks or the base layer – goes between my sleeping bag and air mattress (Themarest NeoAir). Everything’s dry by morning. If I think that the temp will drop below freezing, I always put my water and fuel canister in the bag with me or they’ll freeze. If they do, I’m screwed. Note to self: Screw the water bottle cap on tightly so it doesn’t leak! On seriously cold days – 20 degrees F or less – I hike with my water and fuel inside the inner pockets of my wind layer. Butane lighters stay in pants pockets or they too will freeze. Fortunately, the electric starter on my Jet Boil works. This has magically turned the lighters into dead weight. I’ve described every item of clothing I carry except my bandanas. Almost all the clothing gets used every day. BTW, in the rain, the objective is not necessarily to stay dry. It’s to manage heat. That’s one time when the wet base layer comes off quickly at the end of the day. It’s usually soaked. 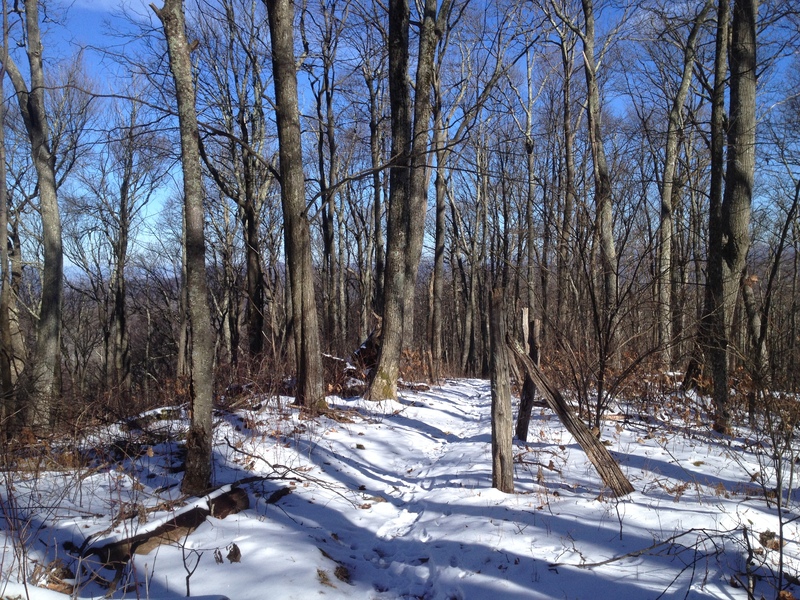 Here are some additional tips that may be helpful in preparing for a winter hike. 1. Practice setting up your tent, operating all your zippers, hooks, snaps, buckles, stuff sacks and cooking with gloves on. Modify your gear accordingly. For example I’ve added extra long zipper pulls and replaced the miniature spring-loaded chord keepers with larger ones on some of my clothing. I modified my tent with extended guy lines and oversize tension keepers so I can manipulate them with mittens on, and or tie the to rocks if the ground is frozen too hard for tent stakes. 2. Quality backcountry clothing tends to have two distinguishing features. The first is large inner pockets. They are to keep, next to your body, water, fuel canisters and any other liquid (medicine) you need to keep from freezing. You can store gloves, hats and mittens there too. The other is pit zips. Clothing designed for fashion tends not to feature these extras. As I noted, when you’re out there hiking hard, dumping heat is a high priority. During the recent storm in the Smokies, the pit zips on my wind shell remained open all day – the temps ranged from 18 – 22, the wind was moderate, and it was snowing. I closed them only when the temps began to plummet and the wind picked up. Meanwhile, I was comfortable and dry. The zipper pulls have been modified with extra long pull chords so I can find, open and close them using gloves or mittens without taking off my pack. 3. When pitching your tent in snow, stomp down or scrape off an area big enough include your extended guy lines. Make sure that your tent ventilates well or you’ll have to deal with frozen condensation in the morning. Pack up quickly inside your tent. Your body heat will create a thin moisture layer underneath that freezes quickly. To negate this, immediately when you get out, lift the tent off the ground so that the floor/footprint doesn’t freeze to the earth. A couple of bloggers reported that problem last winter and their light weight nylon tent floors shredded when the tried to pick them up. Of note, a Tyvek foot print won’t tear. 4. I carry two 1-liter plastic bottles as canteens. When water is plentiful, I only keep one filled. Their key feature is a narrow mouth. If they should freeze per chance, and mine started to in the Smokies because I didn’t pay attention soon enough, you can get a narrow mouth bottle open with your hands and punch down the ice plug that forms. You have no prayer of opening a frozen wide-mouth bottle like a Nalgene if it freezes. The threaded area is large and poses too much friction when frozen. 5. You need to drink as much water in winter as you do in summer even if you don’t feel thirsty. You lose a lot of water just by breathing alone, not to mention sweating. By the time you’re thirsty, it’s too late. Watch the color of your urine. Pale yellow is optimum. Urinating every two hours or so is about the right amount. Be aware that urine the color of apple juice is trending the wrong way. Dehydration helps bring on hypothermia much more quickly – as does exhaustion, alcohol use and smoking. The combo can be like cotton – deadly. 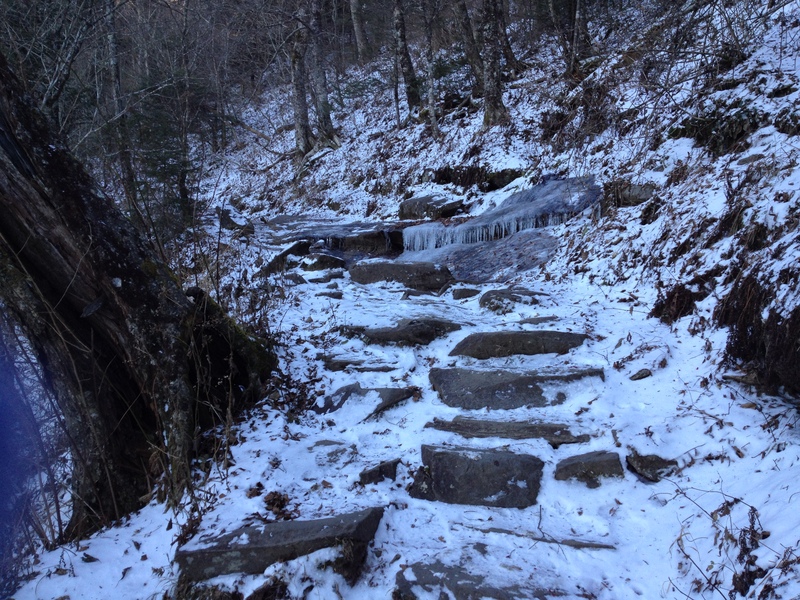 A properly equipped hiker died of hypothermia in the Tri Corner Knob shelter in the Smokies this past winter. Rangers I met on the trail told me that in addition to being cold, they theorized that he might have been tired and dehydrated. Regardless, he suffered a tragic end. 6. I keep a Gatoraide bottle in my tent for use as a pee bottle. Does anyone really want to get up and go out into the hyper cold or driving rain at night? If it’s below freezing, BE SURE AND SECURE THE CAP and put it in your sleeping bag so it doesn’t freeze. Ladies, this may be one male advantage that is hard to overcome. Along this vein, I know of two NOBOs last year who had water bottle accidents that soaked their sleeping bags when their flip top bottles accidentally opened at night! Word to the wise. 7. I shave with a disposable razor every time I stop in town. Beards may look cool, but in the winter they form icicles — and worse — snot-cicles because when its cold your nose runs constantly. This does not include food. The beard problem comes when the liquid in your beard melts and is absorbed by your clothing and sleeping bag at night. Sooner or later you develop a moisture issue that can be problematic. For me, it’s easier to scrape it off when I go to town. Others obviously disagree. 8. I have worn my MSR microspikes on three occasions to great advantage. I could have managed to hike, albeit a lot more slowly, without them. They’re are not a necessity. But, their utility is such that I am willing to pay the weight tax to carry them. I did carry snowshoes for awhile, but no longer. 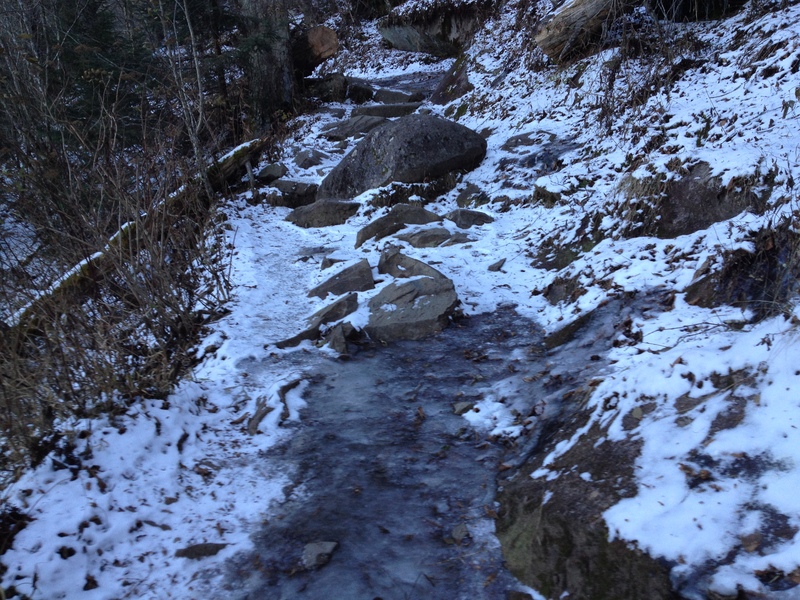 A lot of the trail is unsuitable for their use – too rocky or too narrow. As an alternative, I decided to hike around the weather. Another reason I don’t think snowshoes are needed. Look on the bright side, during NOBO season, some other eager beaver can always be first out of camp and punch the post holes through deep snow for everyone else. When you’re solo, you’re on your own. The trail in winter is peaceful and almost surrealistic in its appearance. With the right skills and gear, you can have a wonderful experience that is uniquely yours alone. Getting one in my pack is a tight fit, but it’s a luxury for which I’m willing to pay. This is the first year we’ve done winter hiking. Have loved it so far. Though we go short trails (beginners), I can feel a real love affair coming on . We enjoyed 3 great state parks in the last couple of weeks. Here are posts on 2 of them. Thanks for the info on gear. We’ve found that a good base layer and 2 or 3 light layers on top has been plenty, down to about 15 degrees. I made a couple of fleece balaclavas that have been great for keeping neck and head warm, but loose enough to not overheat. Chiming in with you, Melanie. It has been fun. The storm beginning now will keep me indoors for a few days, tho. Thanks to jimfetig for the reblog of our Hocking hike. Much appreciated. It was a great blog. I really enjoyed it. Beautiful pics and great tips. Thanks. Have a great day! How much are you typically eating every day? You mention the meals in a bag. Can you dump the meals into the jetboil “cups” and eat out of the cups? Is .8L large enough for a meal? I eat various combinations of Mountain House type dehydrated meals in a bag to which you just add water. Then there’s Ramen which I crunch up in the original bags to save space before I even pack it. I rehydrate Ramen in freezer bags. I often add peanut butter, chicken, Tobasco etc. That’s dinner. Everything else is cold and dry – chocolate, granola, Cliff, jerky, cheese, and other unhealthy high calorie sources. One extra note. I am eating fewer calories than I need. This hasn’t become a problem because I’ve been taking holiday breaks. I do need to add more calories over time. On a couple of evenings I voraciously vacuumed up about twice my normal intake. That was a harbinger of things to come. It may mean more town stops because I can’t carry much more volume. That’s the problem with a smaller pack. Thank you for the information. Your blogs are great :).